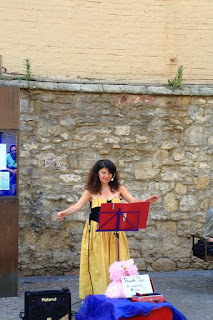 Karen Kay's Pianorocketship: A Wandering Minstrel I - Why am I singing in the streets? A Wandering Minstrel I - Why am I singing in the streets? Well, yes of course it is that and what else? Is it to be free from the strictures of finding a venue; getting permission to play; finding an audience; trying not to be out of pocket; asking friends to come (again) to hear me play; hoping to earn some money for a change? Is it to start from the beginning again? Is it a response to everything I read on Facebook and beyond? Is it to see if I can just go out pretty naked and connect with people one by one? Can I bring a smile or a piece of happiness with music? Is it to remind myself why I play music (after all the verb is play... can I just play and see what happens)? Is there xenophobia in my own community? Where is my community anyway? Can 'just' playing music make a difference? And you were fabulous. I am so proud of you, for your voice and for your courage! Thank you! You are fabulous too!